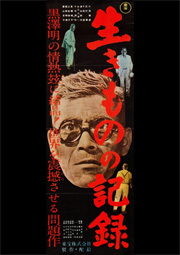 Next on our list of Akira Kurosawa Film Club titles is Kurosawa’s own Record of a Living Being (生きものの記録 / Ikimono no kiroku), which in the English speaking world has also been titled I Live in Fear. Filmed over six weeks in 1955 and released between Seven Samurai and Throne of Blood on November 22 1955, Record of a Living Being is possibly the worst known of Kurosawa’s works from the 1950s. Reasons for the film’s relative obscurity have arguably more to do with its subject matter than quality. 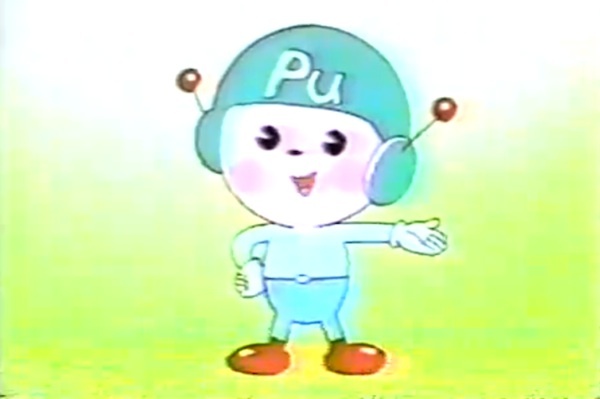 Record of a Living Being was released at a time when the issues raised by the film — the fear of nuclear annihilation — remained extremely topical for Japanese audiences. It had been only ten years since the bombings of Hiroshima and Nagasaki, and the just-finished Korean war (June 1950 – July 1953) had reminded people of the delicate balance that existed between the world’s two new nuclear superpowers, the US and the USSR. Even more close to home, the first hydrogen bombs had been tested at the Pacific and Japan was now limiting its fish consumption due to the increasing number of nuclear bomb tests being carried out in the Pacific. Japanese anti-nuclear sentiment sentiment had also been hugely influenced by the so-called Lucky Dragon 5 incident, when a Japanese tuna fishing boat and its crew had been exposed to nuclear fallout following an American hydrogen bomb test in March 1954, with at least the boat’s radioman ultimately dying as a direct result of the incident. With this background in mind, one would have expected Record of a Living Being to continue Kurosawa’s success at the box office. 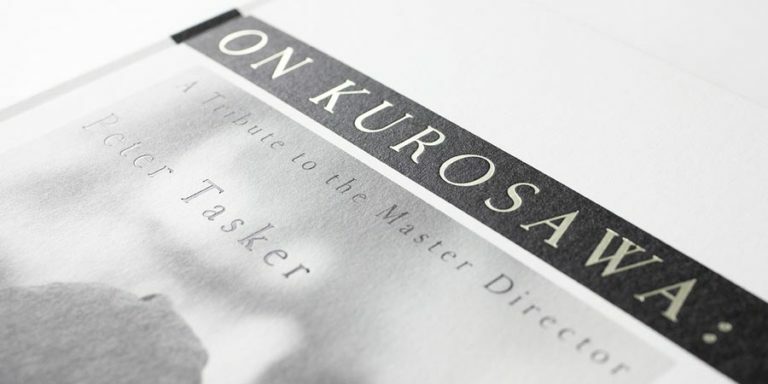 Yet, despite positive reviews, the film became the first of Kurosawa’s works to lose money, with Stuart Galbraith suggesting that audiences were ultimately uninterested in tackling the film’s heavy subject matter quite as directly as Kurosawa encouraged them to, movie goers instead preferring more metaphorical and fantasy-filled ways of approaching the topic, such as Ishiro Honda’s earlier 1954 film Godzilla (Galbraith 223), which we will be watching next month in our film club. Perhaps because of its poor box office performance in Japan, western film fans in turn had to wait until the 1960s to see the film. Record of a Living Being was first shown in Europe in 1961, while the US got it two years later. Once screened to western audiences, the film garnered predominantly positive reviews (Galbraith 221-222), although the limited releases – possibly again the result of the film’s topic – did little to establish it a place next to Seven Samurai, Ikiru and Throne of Blood in the Kurosawa canon. Record of a Living Being exhibits many of Kurosawa’s typical film making conventions, including the use of weather to emphasise characters’ internal struggles. Thematically, the film is perhaps most similar to Kurosawa’s later films such as Rhapsody in August (1991) which also deals with the nuclear threat and Ran (1985), whose protagonist has been compared to that of Record of a Living being. Thematic similarities can be observed also with Throne of Blood, the film that followed Record of a Living Being, with both works seemingly exploring the question of inevitabilities and our chances of taking control of our own lives. In technical terms, Record of a Living Being is most strongly characterised by its documentary style, most similar to Kurosawa’s earlier The Most Beautiful and his later High and Low. The film also marked the first time that the director systematically employed his later trademark multi-camera approach to shooting, something that he had experimented with for the battle scenes in Seven Samurai. (Yoshimoto 246) Yet despite (or perhaps because of) this, the film is a step backwards from the dynamism of Seven Samurai, as not much movement is present, with the sparsity of music only to amplify this feeling. After Hayasaka’s passing, the film’s score was finished by Hayasaka’s assistant Masaru Sato, who would go on to score all of Kurosawa’s subsequent films up until Red Beard, as well as providing the score for the 1999 homage film Ame Agaru. Sato in fact also scored three Kurosawa remakes in his career: the 1965 Sanshiro Sugata, 1973 Stray Dog, and a 1964 version of the Kurosawa penned film Jakoman and Tetsu (originally directed by Senkichi Taniguchi). For information about the home video availability of Record of a Living Being, see the Akira Kurosawa DVD guide. As for the full schedule of our film club, take a look at the film club page. As mentioned earlier, our next month’s film will be Ishiro Honda’s Godzilla, a companion to Record of a Living being. But for now, September belongs to Record of a Living Being. 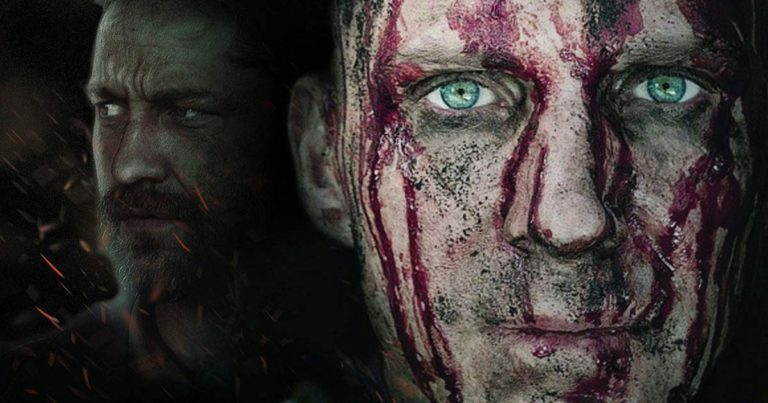 How do you see the film? 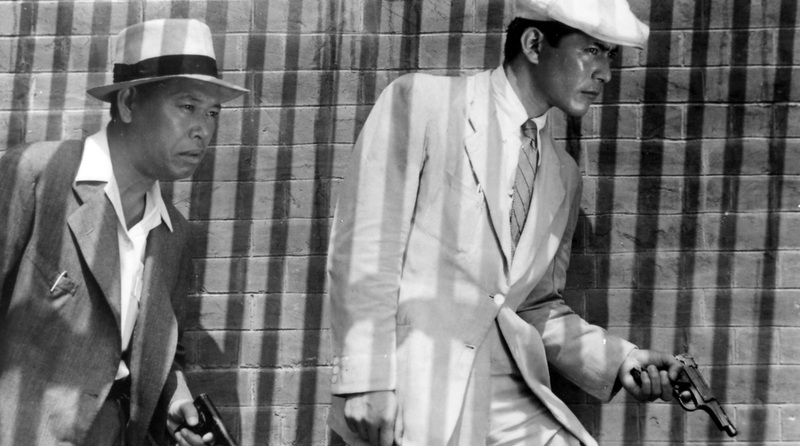 Is it part of Kurosawa’s major films, one of his minor ones, or somewhere in between? Are the topics tackled by the film still relevant in the post cold war era? And does the film ultimately succeed in what it is doing? What about that absolutely brilliant (or is it?) performance by Mifune? 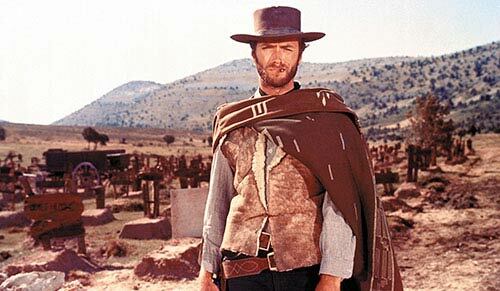 -A lot of characters are introduced in the movie and it’s hard to keep all of them straight. (I guess that corresponds with Kurosawa’s fear that the movie is a little incoherent.) I’m still not sure if the woman with the baby is Nakijima’s daughter or mistress. -The film is too direct and straightforward a treatment of the subject and is overly melodramatic at times. -The subject of nuclear annihilation was never of as much importance in the West, and historical occurrences have now made it much less important, so it’s hard to relate to. -There is a clear, although culturually disfavored, solution to the problem, which is for Nakijima and whoever else wants to to go to Brazil while leaving the foundry and house behind for whoever wants to stay in Japan. It’s too bad that this is not a solution that the court thinks of or that is probably legally feasible without the agreement of all the parties. To me, the real conflict is not over how much of a threat the bomb is, but over Nakijima’s expectation that his entire family will uproot themselves and follow him to Brazil simply because he’s offering to pay for them to do so. It’s his failure to see the selfishness in that that causes all the rest of the problems. In a sense, then, I guess this movie is the antidote to Tokyo Story, where the parents take a hands-off approach to their children and let them dictate what they do on their visit to Tokyo. Despite thinking that this is one of Kurosawa’s minor films, albeit a more successful one than most, Mifune’s performance really blew me away. Although he retains his trademark liveliness, he convinced me that he was a crotchety, curmudgeonly elderly man, not the young, vital actor he was at the time. In many of his other roles, it feels like he’s playing himself. Of everything I’ve seen him in so far, this one was the furthest away from what I think of as his private persona. And a highly superficial aside, what is it with the men in this film? So many of them, especialily those we see least clothed (shirtless or wearing undershirts) looked thin and underweight. I haven’t seen the film in a while, but I must admit this is probably the only Kurosawa film I’ve seen where I felt a bit of disappointment at the end. At the time I thought that the film was something of a dramatic failure, although I think with hindsight that it is more that the specific concerns of the film don’t have an emotional resonance with me (although I can remember as a child being terrified when watching TV news about nuclear weapons in Europe). Back in the 1970’s and 1980’s a lot of Germans and Dutch people settled in south-west Ireland because they believed it was safer in the event of a nuclear war (prompted, I believe, by an article in a German newspaper about which parts of Europe would get least fallout). When I was told that growing up I actually felt more threatened by it, I think the notion of getting vaporised was less scary than living in a poisoned planet. I’ve linked to it before, but I think this article by Fred Kaplin is perhaps the best thing I’ve read about the film and the importance of seeing it within its context. Kurosawa I think was as usual very insightful about the psychological damage inflicted on societies when they (of practical necessity) refuse to face up to looming dangers. The problem of course is that there is no real ‘answer’ to the question of how to face up to catastrophic dangers. If we allow them to dominate our thoughts, the fear alone can destroy us, while pretending they don’t exist prevents us from making proper preparations against the worst. I can’t help feeling that if Kurosawa was alive today he’d be making the film about global warming. It is interesting to read your reactions, lawless and Ugetsu. For me, Record of a Living Being is one of Kurosawa’s best films, and probably the one I’m most interested in from his works from the 1950s. The themes covered by the film are very close to my own interests, and the film does cover quite some ground. It works on the individual, familial, societal and global levels, and is very direct in what it does. And on top of that, we have what I think is Mifune’s best performance on film. While the topic of nuclear annihilation may no longer be quite as relevant as it was back when the film was made, it’s not like we have run out of doomsday scenarios. Whether it’s global warming, overpopulation, business influence, anarchy, vaccines, culinary habits, religious prophecies or something else, it seems that everyone has an end of the world scenario or two to save you from. And beyond that, at the heart of the film there is the question that if you are convinced that something is right, how far can you go to forcibly help other people who do not share your views? Is it ok to knock on strangers’ doors and spread the word trying to save them, whatever it is that you think you are saving them from? How should you deal with your loved ones? Or other people who depend on you? Is it for instance ethical for parents to raise their children under some specific belief system (whether it’s religion or some other ideology)? And what about society as a whole — is it all right to decide policies that affect the population of an entire nation based on some conviction which is too complex to objectively measure? And can policies ever even be created without some such conviction? These are the kinds of questions that Record of a Living Being makes me think about. For me, they are big questions. And this is not the only side to the film, of course. I for instance also love its portrayal of a family, which I think is complex and realistic, and so often overlooked when people insist that Kurosawa wasn’t really capable of dealing with family structures. I also really like the film’s technical style. And the ending is one of Kurosawa’s most haunting. By the way, if you want to watch a good modern companion piece for Record of a Living Being, I would definitely recommend Jeff Nichols’s 2011 film Take Shelter (trailer here). It is in many ways similar to Record of a Living Being, although it does move slightly more on the personal level than Record, which keeps its distance with its documentaresque style. I would like to take part in the film club as a way of revisiting Kurosawa after a long lay off; I’m unlucky with this one though – my only copy of the film is my old Mei Ah DVD. If you don’t know anything about Mei Ah, basically they released versions of Kurosawa films with absolutely atrocious subtitles. This was back in the day when many titles weren’t available on DVD at all. For the most part, the English is indecipherable (the translator seems to have worked from the Chinese translation and in any case has a very poor grasp of English), and I remember this one being particularly bad. I will watch it, though, for the images at least and see if I can make any sense of it. Would love to get a proper version but the situation in this country (Greece) is shaky and I don’t think my funds can extend to a new DVD. I watched it again last night, first time since the last time round in the film club. I actually enjoyed it more this time, the story fell together for me and I enjoyed the family dynamics better – I think that this is maybe one of the best true ‘ensemble’ works from Kurosawa. Unfortunately, I think Mifune overdoes it at times, and I couldn’t help wonder what Shimura would have done with the role – in all honesty I think it would have been a better film. I think this time I also appreciated more what a good, subtle script it has, there are some great lines in it which serve to humanise the main characters. I particularly liked the dynamics between the younger daughter, Sue, the only one who seems not to be thinking of money, and the older brother, Jiro. It was lovely the way she always seemed able to niggle at him and undermine his attempts at gravitas. As I said in the other thread, it’s great to hear from you, Jon! I hope you’ll find a solution to watching the film. It’s really quite depressing what’s going on in Greece. Ugetsu: I couldn’t help wonder what Shimura would have done with the role – in all honesty I think it would have been a better film. It’s an interesting idea, but in my mind Shimura would have changed the main character quite a bit. As much as I love Shimura’s work, I think he wouldn’t have been able to convey the same level of inner turmoil that Mifune manages. When watching Mifune’s Nakajima, I feel anything can happen. He is like a nuclear bomb ready to explode. Shimura would have been mellower, I feel. His characters (with Kurosawa, anyway) tend to be those of “experiencers”, or ones who have things happen to them and then try to make do with what they are given. Mifune’s, on the other hand, are doers. They don’t accept the hand that’s been dealt them, and want to play with their own cards instead. Ok, maybe that’s an oversimplification. In any case, with Shimura Record would have at least been a very different film, just like Ikiru would be very different had Mifune been the lead there. Oh, and Sue’s my favourite, too. I’d agree with that – the weakness of Shimura in the part would have been that as a more introverted, more physically frail individual it would be easier to see the family and system railroad him into doing things he didn’t want. With Mifune its easy to see him as a force of nature, impossible to stop once he set his mind on something. My problem with him in the part is that he was such a smouldering volcano that I found it easier to dismiss him as a nut, rather than empathise with his dilemma. Indeed, perhaps the family aspect of the film would have been more nuanced with Shimura in the main role. But I do like how the film doesn’t really try to make a case for Nakajima’s sanity. It’s up to us to think about it. Jon Hooper, whatcha doing in Greece, and where, exactly, in Greece are you doing it? Is this a permanent move or temporary visit? I ask, because I spend a lot of time in Greece. I also have the Mei ah…! Wow, they are so bad they are almost able to kill Yojimbo with mangled subtitles and poor quality transfers. Gess what, though? NOT QUITE! The films are so good, even Mei Ah can’t kill them. So, enjoy your reviewing! And, of course, though different, Shimura is always wonderful and could have been good, too…I imagine the film would have been a bit darker, though…Mifune plays it a bit distant…Shimura could have been a little more present…particularly the bit about the mistress and child…and it would have been creepy. Shimura spooked me back in “Stray Dog” licking a popsicle with a female prisoner in the heat…(he can be a bit of a creeper). Hey cocoskyavitch, I have been in Greece since 1998, teaching English in a frontistirio (private language school). My wife is Greek, so that’s basically why I am here. The country, as everyone knows, is going thru hard times, so I’ve got one eye on going back to my home country (Britain). We’re on Euboea by the way. Yes, Jon, I saw the hardship this summer…and the anger and frustration in Athens. I really love Greece so much…and have traveled widely, for many years on the mainland, Peloponnese, Rhodos, Kriti, Cyclades…but not Euboea…I imagine though things are tough, they are better there than in Athens or Thessaloniki. Kriti seemed unaffected this summer. Are you in Khalkis? Just watched it and hadn’t read this thread yet. I wanted to just dive in. My understanding of the movie — some kind of osmotic understanding before watching it or reading about it — was that it was going to be a dog. I don’t know why I thought that was the general world-consensus, and I really expected to do some fast forwarding. But it was much more enjoyable than I bargained for. I love the feeling of it, the stretched sunshine, the heat boiling beneath the surface of every shot…those people are damp and hot! And Mifune is the walking bomb, is he not? Vili, I think you mentioned that he seems about to explode. I felt that way too, and felt that his whole persona was linked to the bomb itself. Weren’t we all afraid he would blow? Didn’t they institutionalize (detonate) him before he could cause anyone any harm? I loved the family dynamics. The Nakajima family is now officially one of my favorite Kurosawa families to watch. Yes, Sue and Jiro are a riot. And what’s with the daughter that primly holds her lips tight and serves tea and either is just holding it in so as not to blow up herself, or maybe she is on the edge of insanity in some way too. The way she looked up and out the door as she closed each curtain against the dark night sky was really creepy. She had an evil or insane look in her eyes. Mifune. Well, I have to admit here, not one of my favorite performances. Wait, wait, wait, you are throwing soybeans at me now!! Stop! I love him. You all know that. Love him to tiny pieces. And I really loved that he got this chance to go way out there. He did a fine fine job, his stance, his mouth, the way he used the glasses to show his age (like looking over them to read his bus ticket – a natural habit of older people), etc. I just hated the make up. Hated it. It was unrealistic to me to the nth degree and so I kept feeling like here’s this much younger man playing an older man. I never got lost in his character. So I stood outside of his character most of the time. Sorry to say. I can appreciate what he did and I can appreciate how much y’all loved him in this, but it didn’t quite do it for me. We can only imagine Jiro growing up, eventually knowing about these other families. Not only was it a shame on the family, but the disrespect he would feel for his father not only on his own behalf but also on his mother’s behalf, would of course intensify over time. And wasn’t Nakajima selfish? Wasn’t his hunger for “getting what he wanted when he wanted it” pretty clear — as we, the audience learn more and more about his life? Of course, I have to say, I felt like part of his voraciousness was a need to protect those that he loved. He didn’t abandon anyone that were depending on him – for all his life. Until the end when the bomb finally did explode (the fire) and killed the livelihoods of all of his workers and his family. Totally thrilled with that last moment, the ramp going up (or is it going down?) and Shimura heading down (older, much closer to death) and the young daughter with her baby boy heading up, up up. Great damn moment. Lawless, yeah, you’re right. Skinny men half naked men. By the by, I just read some of the earlier posts from yesteryear. Just wanted to throw in here that I found equally appalling the make up on the Japanese Brazilian. It didn’t reek of racism so much as just a really poor makeup department. It was so unrealistic that it became funny. And maybe, Vili, you’re right when you said that it’s quite possible that this was a hold over character from the original story line which was supposed to be a bit of a satire. However, even with that in mind, there is not even an ounce of reality in that make up. Mifune’s was so-so, I could get over it after a few minutes (but ugh, hated the darkened ribs under his robe! That was so bad, my 11 year old could have painted that on him!) But the Brazillian — that was about as bad as any black-face white man I’ve ever seen in old Bo-Jangles type films. Glad to hear that you enjoyed the film, Amnesty! This got me thinking how the film would have been different had someone from the family actually gradually started to understand Nakajima’s views, even if rejecting them at the end. As it stands, the film is quite polarised, and I can understand why. Perhaps having a character truly in the middle of the argument would have softened it too much. I can understand your inability to accept Mifune as an older man. While I have no such problems, I once had a long discussion with an older Japanese lady who was very determined to explain to me why exactly Mifune’s character in Record of a Living Being doesn’t work realistically. She based her argument on Mifune’s hands and eyes which, she said, are still too young. Which they probably are. I resisted seeing “I Live in Fear” with the crazy x-ray specs cover putting me off my lunch for years. I didn’t want to…wouldn’t accept Mifune ugly and old. For me, he was too convincing! 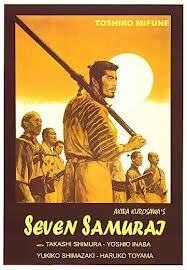 I actually think it is quite a good film, and Mifune quite good in it.